Colmans Garage of Bishops Lydeard, Somerset. Homepage. This page: An invoice detailing work done to a Standard motor-car in the mid 1950s. There are quite a few old garage-related invoices in this section of the site now, including others also from the Somerset area. 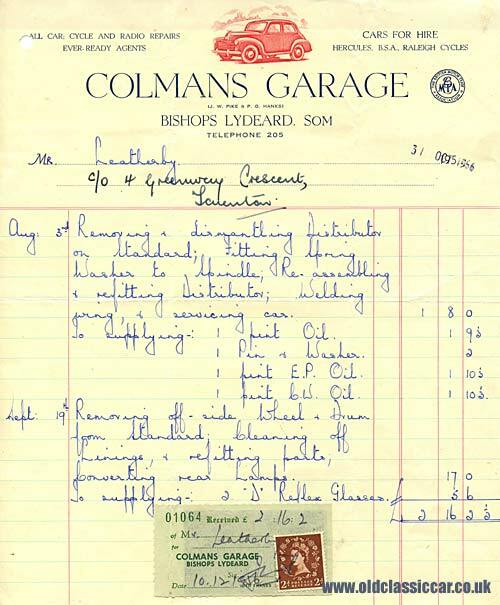 The invoice shown below was issued by Colmans Garage, a repair shop located in Bishops Lydeard in Somerset. The proprietors were a J.W. Pike and P.G. Hanks. As well as motor repairs, they could also supply cars for hire. If you were more interested in two wheeled transport, then a visit to the garage could see you pedalling away on a brand new Hercules, BSA or Raleigh bicycle, depending on your preference. The invoice is illustrated with a drawing of an L-Type Vauxhall Velox, although nothing on the invoice suggests that Colmans Garage was a Vauxhall distributor. The invoice details work done to a Standard belonging to a Mr Leatherby, c/o 4 Greenway Crescent in Taunton (a short distance from Bishops Lydeard, down the A358) in October 1956. Greenway Crescent still exists, and seems to comprise standard-looking semi-detached houses. However there don't seem to be any online references to Colmans Garage, so presumably it has either been re-named or else swept away during a re-development. The model of Standard being repaired isn't specified, although there are a few clues that suggest it may have been a pre-war example. Work done on the 19th September mentions "converting rear lamps", and the supply of two "D" lamp reflex lenses. "D" lamps were usually found on pre-war cars, either side of the rear number plate. Other invoiced work included cleaning the off-side brake linings, rebuilding the distributor, welding a wing, and giving it a general service. In addition to the lamp lenses, parts supplied included various grades of oil and a split pin & washer. Total cost for all this work was £2 16s 2d. A month or so later, the same Mr Leatherby had some more work done on his Standard, but this time at County Garage, a Standard Triumph agent in Taunton. Return to the Motoring Collectables section for more items of interest to vintage and classic car enthusiasts, including more illustrated invoices and billheads.